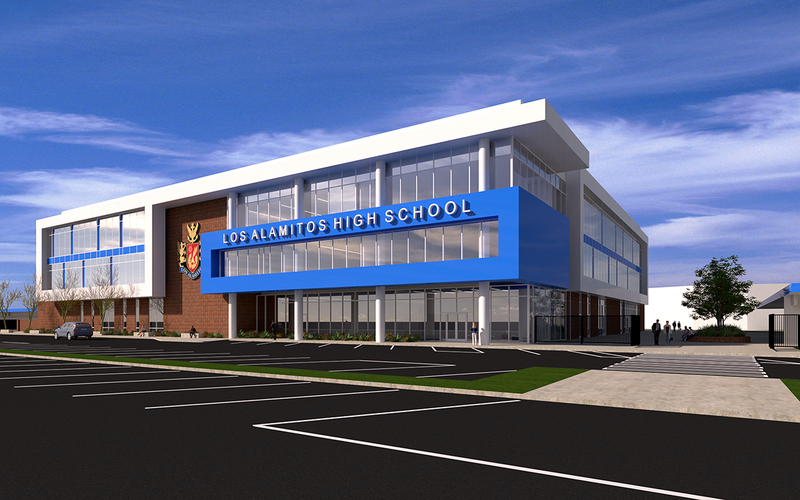 Los Alamitos USD Selects WD to Design a New Addition to Their Sole High School Campus: a Multi-story STEM Classroom Building. At 50-years-old, Los Alamitos High School needs new Science, Technology, Engineering and Math instruction spaces. Los Alamitos USD selected WD to deliver the learning environment for students and staff that will carry the campus into the future. The new 83,000 sf STEM classroom building is being planned for the front of the school creating a new face for the campus and the Los Alamitos community, while improving long-term student safety and campus security. Additionally, the project will allow the campus to replace numerous portable classrooms with permanent classrooms (P2P) and allow for expanded Career Technical Education (CTE) pathways. The new building will include 14 science classrooms, 16 general classrooms, and career & technical education centers for engineering and robotics. WD is working closely with the District to secure CTE state matching funds that will stretch their construction dollars and maximize the impact of the project to the sole high school within the district. The estimated $52.4-million project will be financed through sale of Measure G bonds, which was approved by voters last month. Los Alamitos USD has a long-standing legacy of excellence in Academics, Athletics, Activities, and the Arts and strives to provide a meaningful standards-based curriculum that guarantees all students the opportunities and resources to attain the skills, knowledge, and values necessary to function as responsible and productive members of society.